The Senate confirmed Jerome Powell (left) and Jeremy Stein to serve on the Federal Reserve Board of Governors. NEW YORK (CNNMoney) -- It's about time. For the first time in six years, the Federal Reserve Board will soon have a full roster. The Senate confirmed two of President Barack Obama's nominees to the central bank Thursday. 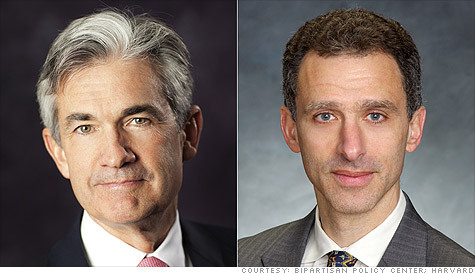 Jerome Powell, 59, a lawyer and former investment banker, and economist Jeremy Stein, 51, are being named Fed governors. The Federal Reserve Board in Washington is supposed to be headed by seven voting members, but the last time all of those seats were filled was in April 2006. The seven members of the Board of Governors are the central bank's highest ranking officials. Appointed by the president and confirmed by the Senate, they serve 14-year terms, but many resign before completing a full stint. Both Presidents George W. Bush and Obama have struggled to push their nominees through the Senate. Obama's previous nominee, Nobel prize-winning economist Peter Diamond, withdrew his nomination last June, citing opposition from Senate Republicans. The newly approved Powell and Stein garnered more bipartisan support, because they represent both sides of the aisle. Powell is a Republican and has donated to presidential candidates John McCain in 2008 and most recently Mitt Romney. Stein donated to Obama's campaign in 2008. "I'm here today not only to say that I admire the nominees," said Sen. Lamar Alexander, a Republican from Tennessee. "I want to acknowledge the fact that the President chose to break the stalemate by nominating Mr. Powell, a Republican, as well as a Democrat." Prior to the vote, Republicans also noted their discontent with the Federal Reserve's recent actions. The Fed has kept interest rates at historic lows since 2008 and enacted two rounds of asset purchases in an effort to help the economy recover from the recession. Republicans fear those efforts will eventually lead to a sudden rise in inflation. That said, many were willing to vote in favor of the nominees anyway. "They're not ideal from my perspective, but they are qualified," said Sen. Bob Corker, a Republican from Tennessee. Both Powell and Stein hold degrees from Princeton and have served briefly with the Treasury Department. Powell has recently been working as a visiting scholar at the Bipartisan Policy Center in Washington. He served as Undersecretary of the Treasury for Finance under President George H.W. Bush. An economics professor at Harvard, Stein served as an adviser to Treasury Secretary Timothy Geithner and worked for the National Economic Council. He holds a bachelor's degree from Princeton and a Ph.D. in economics from the Massachusetts Institute of Technology.